RE: Does Dell Technical Support Know Anything About Their Computers? I recently bought a new gaming inspiron 5675 desktop gaming desktop. A GAMING desktop. I found that it shipped with only 1 stick of 8GB ram in single channel. Ok, so I call Dell support and say hey listen does this computer support dual channel? I mean it's 2017 I would assume that it does right? Technical support told me NO it does not support dual channel. Sales told me YES it dose support dual channel. They told me it used SO-DIMMS though so obviously they aren't very bright. So, what's the answer? I would assume a Ryzen board would have to support this. The run around and absolute lack of knowledge these support people have about PC's in ridiculous. Until I got a manager the tech people didn't even know what dual channel was. I had to provide them links from Dell's site. So, then I said well look why can't you guys send me 2x4gb and I'll send you the 1x8gb back, bam easy. Nope. They refused and won't even give me my original discount on my purchase. Why would a gaming PC not ship in performance configuration? That page doesn't state that it comes as a single stick... where does it say that? Not looking to get in a back and forth. That doesn't address the main question. Tech support told me this motherboard WILL NOT support dual channel even if I did buy another stick. Sales told me does support dual channel. Who is correct? I'm not wasting time or money on a system that is handicapped. The system has 2 Ram Slots only. I say this because the configurator looks like this. Thanks for those trying to help. I went ahead and just bought another stick of ram off of Amazon that will be here tomorrow. I'm just gonna stick it in and see if the motherboard switches to dual channel mode when it sees the second stick of ram. The chipset is sourced from AMD I assume so it should support it, but I've seen handicapped systems from Dell in the past. Most of the tech support people had no clue and thought "dual" just meant does the board take 2 sticks of ram. 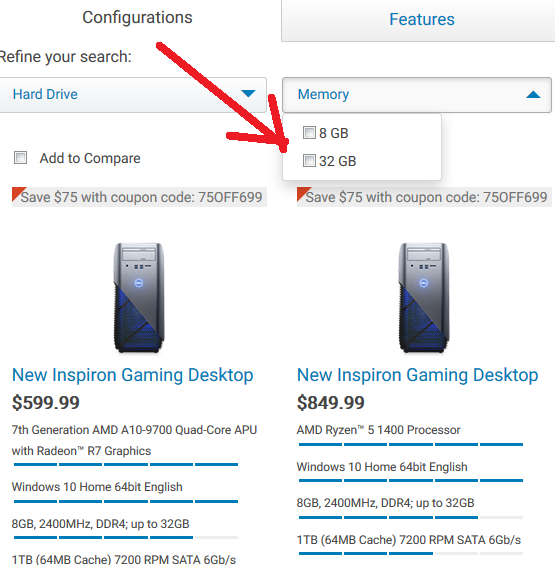 This is what dual channel memory is: www.dell.com/.../buying_guide_memory . So, I'll test this myself and report back since Dell can't provide an answer. IMO Dell should ship "performance" or "gaming" oriented PC's in the configurations which yield the best performance. It only behooves Dell to provide their end user with a better experience. Why handicap a Ryzen chip by shipping a product in single channel mode with half the bandwidth? Well the seems no one has definitively answered your question about whether or not dual channel is supported. But if you are concerned about system performance then the answer does not matter that much. Based on two studies I found by Googling "single vs dual channel ram" the conclusion was that there was no significant performance gain between single and dual channel. I would also say you a fortunate that you have 8 GB in a single memory stick, that means you can expand to 16 GB by purchasing another stick instead of being stuck with two useless 4 GB sticks. Well, I continued to receive terrible service from Dell. I literally called 8 times to sales to try to get the proper stick of RAM. Most representatives were trying to sell me SO-DIMMS for laptops. One told me 200+ for one stick (she was clueless and looking at ECC ram), one guy told me $125 (laptop ram), couple hung up on me because I informed them how incompetent they were, and one told me they didn't make ram for my system yet (WHAT?). I finally got a lady that actually knew how to turn a computer on and gave me a 7% discount even though Alexander Saravia promised me a 10% concession they would not honor it and Alexander refused to respond to further emails. Anyway, the board DOES run in dual channel mode. The stick of RAM I got from crucial was not stable in the system at all and routinely wouldn't boot, even though Crucial says it was the correct module. Ryzen boards do have issues with a lot of RAM since they are so new at this point though. The Dell rep sold me a stick made my Visiontek and it's currently in the system and appears to be working fine. As for dual channel performance. It makes a very significant difference in performance if your application needs a lot of memory bandwidth. Some games (not all), video editing, engineering and other professional applications see very significant boosts. Dell also sells these gaming pc's with AMD APU's. With built-in graphics chips on the processor die, dual channel makes a HUGE difference in performance. If AMD APUs require dual channel for performance Dell should not be selling this gaming system with memory configured in single channel. Perhaps Dell cannot get this system to work reliably in dual channel mode. Have you tried your crucial memory in single channel mode (removed the memory from Dell)? I unfortunately didn't try the crucial stick on its own. I should have. It's been 2 days stable with the visiontek ram stick though and performance has been very good. Honestly 99% of the problem and aggravation has been the Dell tech support. I do still have a minor problem, the front usb ports that are with the card reader have input lag when I plug in my wireless mouse and keyboard. They are fine when I plug them into the ports on the back. I think I'll go about figuring this problem out by myself without Dell lol. Starting with just reinstalling the drivers. The only positive thing I can say out of all this is if this PC does continue to operate good, I got a fantastic deal from Dell on the black Friday in July sale. Ryzen 1700X and RX570 w/ 16GB Ram for $800. You can't built it yourself for near that cost. How much was the stick of ram from Dell? Is there a link to it or do you have to call?